For the last 30 years, we have tirelessly worked to perfect our brand and make it the next great concept - from our training, support and product innovation to our operations and marketing strategies. Our model combines the simplicity in operations of a QSR kitchen with the revenue of a casual dining restaurant. When you join the Buffalo Wings & Rings team, you truly join a family. Our club includes leaders and franchisees from Panera Bread, Subway, Max & Erma's, Dunkin' Donuts, and Marco's Pizza. Like our current franchise owners and operators, we are seeking individuals with business, restaurant or service experience as well as the necessary financial resources to invest. Our strong system-wide leadership is showcased in our sales. In 2017, our brand continued to achieve remarkable growth, boasting a 10.5% increase in average unit volume year-over-year for the last eleven years. We've also cracked the code with regard to the food-to-alcohol ratio, checking in at the industry dream of 3 to 1. The chicken wing industry is hotter than ever. Americans ate more than one billion restaurant orders of chicken wings between 2016 and 2017 - and we intend to capture more of those hungry guests. In 2017, we outpaced the overall casual dining industry. But we don't want to own just wings. More and more restaurants are adding wings to their menu, therefore our menu will continue to evolve and innovate to ensure that WE'RE NOT JUST ANOTHER WING JOINT. In order to protect the long-term growth of our brand, we understand that we are not the only chefs in our kitchen. Our franchise advisory council plays a significant role in all of our decisions - from operations to marketing to support. For a brand to have significant growth potential, it must leverage the power of experience. We do this to ensure all decisions are the right decisions for the brand. Training - At Buffalo Wings & Rings, we believe the foundation of success begins with thorough training. We also believe the most effective training combines on-the-job field experiences with classroom instruction that covers all aspects of managing and growing the business. 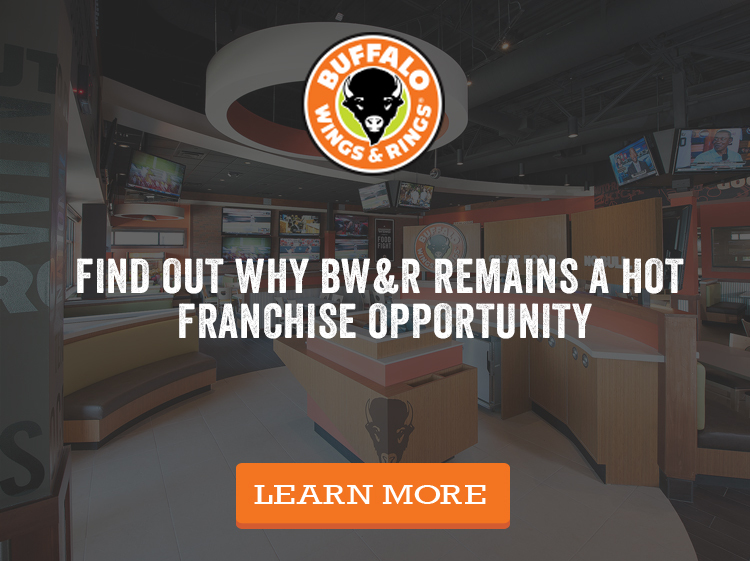 Each Buffalo Wings & Rings franchisee is given extensive five-week training at our corporate headquarters in Cincinnati, Ohio. I.T. - Our proprietary system allows you to operate the technology of your restaurant portfolio with ease, while providing important data to franchisees and the franchisor so that we can constantly consult to make improvements to your bottom line. Logistics & Supply Chain - Coming from a background in purchasing and logistics, our experienced leadership team has perfected our logistics and supply chain to maintain the best food cost ratios while remaining committed to top-line products. Rare in our industry, we do not get rebates from our vendors; instead, we give them back to the marketing and business building fund. Supplier Management - Our world-class vendor partners are integrated into our system and provide best-in-class economical solutions that are aligned with our brand mission and help drive awareness and growth. Marketing - We maintain a big brand experience for our franchisees and our customers. Our marketing team works in conjunction with specialty agencies in public relations, social media, customer data, marketing and advertising to achieve results and create positive, big moments for our brand. Support - While creating great systems, products and training are core components of our offering, the ongoing support we provide is designed to find more wins for your bottom line. Think about the term "family" when joining our brand. Family must have your back in order for you to succeed.